She can be found around the Crabber's Shanty. 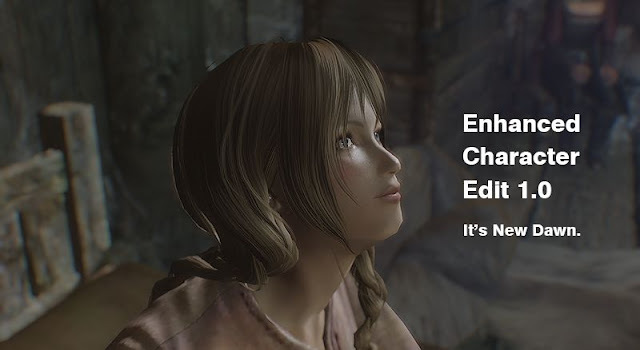 Removes the cannot wear children clothes version.Adds snood to costume.Adds facial textures and facial expression for maisha only.Changes modeling.Packs to bsa.Adds versions for Xbox One、for Special Edition. Upgrade to 2.0 I packed to bsa, uninstall it once, and install ths mod. If you use normal version (it is not child cloth version), please following work. Update 2.0Added parts:eyes+2 lip+1 nose+1.Improved eye textures, UV and mouth mesh.Adds facial textures in Nexus option file. 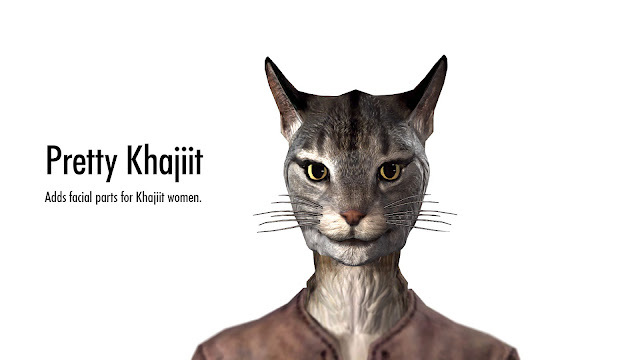 Feature This mod adds facial parts which like cat for Khajiit women. Adds wide eyes 5 textures for Khajiit men and women.The second khajiit preset like cat.Adds facial textures for Khajiit women in Nexus optional file. Optional Files Adds facial textures for Khajiit women in Nexus optional file. 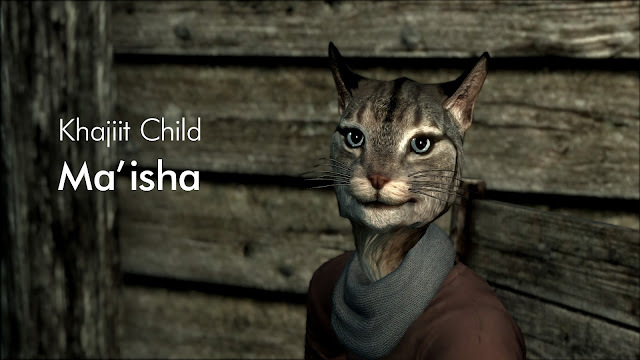 It is used Khajiit Child Ma'isha, slightly modified. Permisssion - Forbid upload tri files. - Feel free to use your created by it. But if you use textures file, need to write credit. What is this? This mod replaces textures of the eyes for human races in Skyrim. Irises colors like vanilla a little bigger(x1.02). This position is slightly lower. Clean(less bloodshot) and bright white of eyes. Natural Inner.Corners of Eyes.Natural Eyelashes.More reflective gloss Eyes. Not include Beast and Elves Eyes. 2012.04.03 - v1.1 fix Light grey and grey edge of the iris. 2012.07.06 - v1.2 Longer and thicker Eyes Lashes. Normalmap fix. 1.9の変更点Renew textures for men.Reduce texture size of specular file.Clearly double eyelid 1.8の変更点More realstic textures.Added pretty face for men. Removed eyes files.Meshes fix and eyebrows files moved to option files.Remove _sk.dds file. Option Files ・Pretty Face Eyebrows This files included in ECE. If you installed ECE, it is unnecessary. Female only. ・Darker Eyebrows It is twice darker eyebrows than above eyebrows. ・Flatter Normalmap It is a normal map to make it look flatter. Specifically, eyelid and nose are less shadows. Texture can be used even if it is not a Pretty Face. ・Pretty Face Mesh Fix Modify rounded cheeks and symmetrize the around eyes. Female only. MCM function including list functionIt is not affected by stealth. (Dark is recommended because there is little influence)Name display when attach a light The magic called Facelight Reset is added to the item of power. Reset all Face Light Targets. Introduce Hi, I'm tktk. 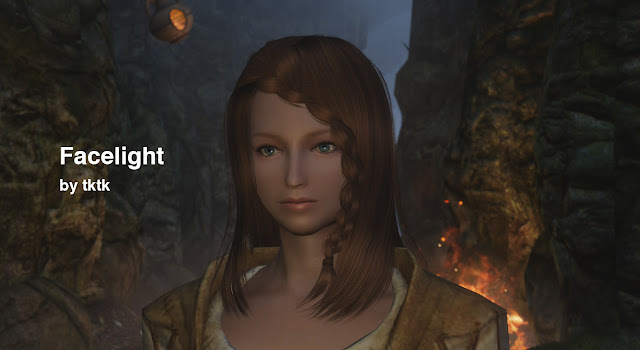 My hobby is modding Skyrim. I'm good at character creation or combat mod. Moreover, please also note that opinions and requests may not be adopted. I am accepting donations or supporting at any time. Please choose from following two ways. Please replace [at] to @.